We all rely on artificial intelligence everyday, whether we refer to it as Google, Siri, or Alexa. Can you imagine the potential AI has in healthcare? The opportunities are limitless. We've come so far so quickly, and HIMSS is a great opportunity to get a sense of what the future holds. MEDITECH will be presenting with Nuance Communication on artificial intelligence at HIMSS. We’ll hear more about how MEDITECH is integrating voice commands into their Expanse EHR to help streamline physician workflows, and get a sneak peek at future innovations that are in the works. Standards-based APIs are a game changer for interoperability in healthcare. By giving providers, patients, and consumers direct access to specific data points through convenient apps, they will get to see and use information in ways they never could before. Healthcare today is about more than just EHR capabilities, and mobile apps are definitely the future. MEDITECH will be doing a joint session with Forward Advantage to highlight use cases of their Greenfield Open API platform. Greenfield is a new app development environment supported by RESTful APIs to help cultivate user-friendly innovations in healthcare. There will be a really interesting panel discussion on the collaboration and technological advances that are necessary to move us all forward. Population health is one of the most important topics in our industry today. Organizations need to find creative ideas to improve care even when their patients are outside the hospital walls. I can’t wait to see how different organizations are addressing social determinants of health in new and exciting ways. MEDITECH has really expanded its population health strategy including enhanced risk stratification, care gaps management, and analytics, enabling care teams to manage patient populations across all settings, through a single integrated web platform. Be sure to check out their market debut on February 12th from 11:15 - 11:35 a.m. in the Lobby E Market Debut Theater. Today, mobility has really changed the way we work. We can now review a patient’s history, place and adjust orders on the fly in the ED, and move easily onto the next patient without having to stop at a stationary workstation or WOW. This technology has improved patient engagement; I can actually show them their results and discharge instructions to make sure they understand them, and use the data in front of me to convince the patient why they need to be admitted. Many of the modern web interfaces that we see and use in our personal lives are now available in an EHR. I’ll be discussing this in detail at booth #3921 and leading a demonstration on Wednesday, February 13th at noon on the importance of mobility in the ED and how to foster patient engagement. Last but certainly not least, as an avid MEDITECH user, I’m really looking forward to their customer appreciation celebration. This year it will be held Wednesday, February 13th at Mango's Tropical Cafe. 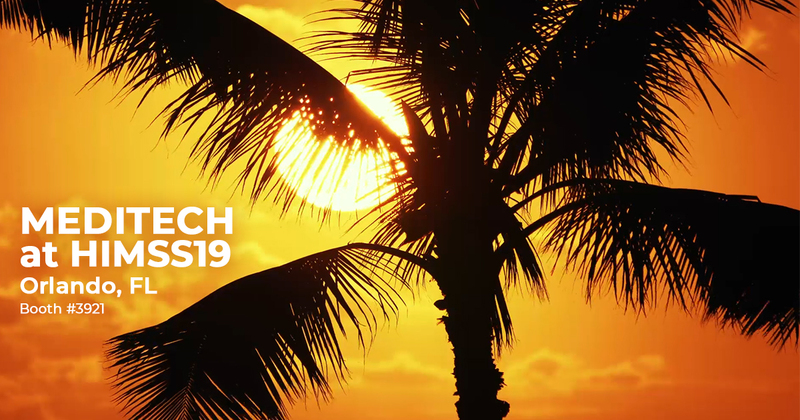 It will be a great opportunity to connect with other MEDITECH users, share strategies, or just enjoy a few drinks. Either way, after a busy day on the HIMSS floor, it’s a great chance to let loose. I love telling stories, sharing knowledge, and meeting people from all walks of life, and I’ve never been more excited about sharing my experience than with MEDITECH’s Expanse platform. It has many of the conventions that we see and use in our everyday life. For instance, Google style search bars, Amazon-like shopping carts for your orders, voice recognition directly through your tablet, and customizable widgets similar to the ones you have on your smartphone display. The refreshing part of this whole experience is that I’m not selling a product. I’m simply sharing my experience with an EHR solution that has enhanced patient safety, care quality, and literally given me more time to just stop and sip my Diet Coke. I urge you to come by MEDITECH’s booth, sign up for one of their HIMSS demos, watch my demo, and meet with myself or one of my fellow clinicians to hear our first hand experience on Expanse. There really is no substitute to hearing from those who rely on the software in their everyday lives. I hope to see you there! Be sure to read our HIMSS19 recap blog, written by our own first-time attendee, that focuses on key areas in the future of health IT including AI, interoperability, #WomaninHIT and more!